What happens when you gather a group of women together who love to bake and drink? You have a Cupcakes & Cocktails Party! A couple weekends ago, I hosted such a party with a few girlfriends. We each made a batch of some cupcakes to share and enjoyed a few cocktails while we caught up with each other. It's a great reason for getting friends together... but then again, cupcakes have this crazy way of bringing people together anyway. For our soirée, I wanted to make a cupcake that was a bit more interesting than the usual flavors everyone is familiar with. What I finally decided on were these Banana Cream Pie Cupcakes. Heavenly. They were so light, creamy, and a much easier way to enjoy all the flavors of banana cream pie without a fork! These cupcakes would be perfect for a picnic or a spring/summertime party. If you have a Southern inspired meal, these would also be a great dessert option. If there's anything else I'd do to jazz these up, I'd probably also garnish with some toasted almond slices, just like some banana cream pies are garnished. If you would rather make these cupcakes ahead of time, you could also substitute the fresh banana slices with banana chips for garnish. Preheat oven to 375ºF. Line 24 muffin cups with paper liners. In large bowl, whisk together flour, baking soda, cinnamon and salt. Set aside. In another large bowl, with electric mixer, cream butter with granulated sugar and brown sugar until light. Add eggs, one at a time, then vanilla. Add flour mixture alternately with -bananas and yogurt, mixing on low speed just until moistened. Batter will be lumpy; do not overmix. Gently fold in chopped walnuts. Once cupcakes are cool, insert a paring knife into top of each cupcake, making a small hole in the center. Spoon filling mixture into a zip-top plastic bag. Snip off a small corner of the bottom. Squeeze about 1 Tbsp. filling into the hole in the top of each cupcake. Swirl frosting on top of each cupcake; sprinkle with graham-cracker crumbs. Top each with banana slices as desired. Keep chilled. Ooo I've been looking for a good banana cupcake recipe! This is so yummy. I just love this. These look delicious! I love banana cream pie. Definitely going to make these. I love these! Must try! Made these tonight--used Martha Stewart's basic buttercream for frosting instead and rolled covered cupcake in crushed graham crackers. Delicious! What a delicious cupcakes! 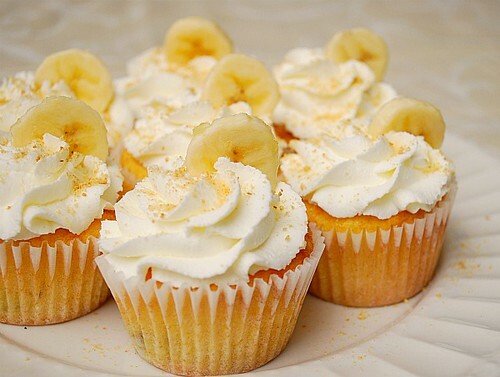 I adore banana in cupcakes ! Great recipe and good job.